My boys have been fans of Playmobil for many years. 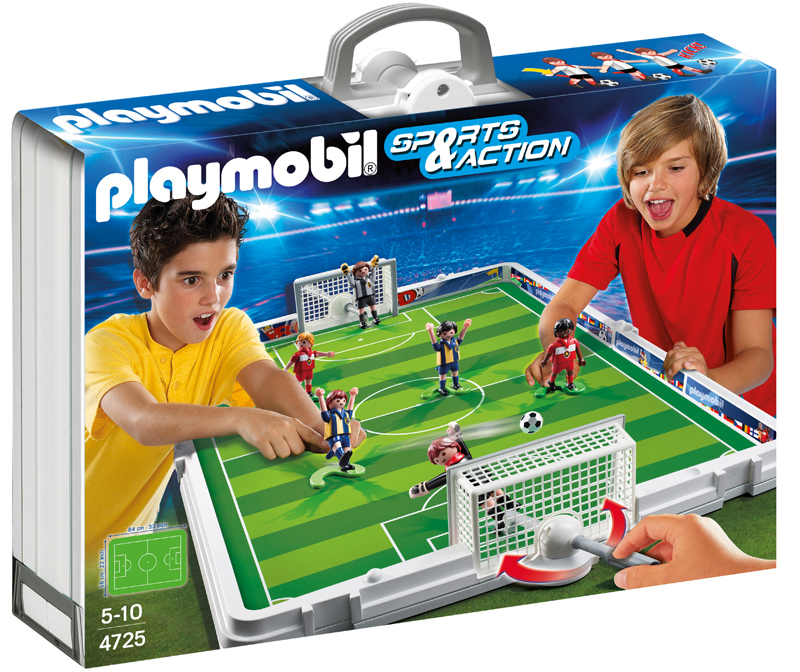 Nate and Lydia also love soccer, so when we had the chance to try out the new Playmobil Take Along Soccer Match , I knew we had to check it out! When it arrived, Nate was pretty excited to see that it was a soccer game. The concept is great, because the field folds up into a handy storage box that holds all the pieces. When the kids want to play, it's easy to unfold and set up the field so they can play quickly. You can see in the video below that they have a great time playing the game. We've had it for a few weeks, and they have played almost every other day. Nate loves the fact that the players can kick the ball, and Lydia loves making her goalie jump around in the net. I have always loved the unique playsets that Playmobil creates, and while it has always been a pricey toy, the play value and quality have always been high. We have never been disappointed by a Playmobil purchase. Thanks to Playmobil and My Blog Spark, I have a soccer match to give away to one of my readers! To enter my giveaways, I ask that you fill out my simple giveaway entry form. You'll find the entry form by clicking HERE. When you get there, you'll enter your name, email, the name of the giveaway (below) and answer the mandatory question (also below). Please do NOT leave a comment on this post to enter the giveaway. Mandatory Question: What's your favorite sport? I will choose a winner on September 20, 2012. Good Luck! !